In middle school, Ichinose Kimitaka taught his friends how to play basketball. Despite his experience with the sport, his friends quickly outmatched him in skill. After an incident brought on by his frustration and jealousy, he was crushed to overhear those same 'friends' discussing how they wished he'd just kill himself. On his way to toss out his special basketball shoes, he met a girl who was just as frustrated, throwing her own dancing shoes away. She was so tall, and her hands and feet are so large, that she had been rejected from her chosen hobby of Spanish dancing. He urged her to give basketball a try, and the two exchanged their shoes instead of throwing them away. Tetsugaku Letra is like that piece of cake that you want just one more bite. The story reels you in, every single chapter. It’s so painfully realistic, without the frills and bells of school life manga, while being so wonderful warm in its simple storytelling. To be honest, I fell in love quickly with the characters. Fujimoto, Ichinose, Kikuchi, Ishikawa... loveable dorks who try their best in ever way. Echoing the fact that it’s very realistic: all our protagonists have something they feel bad about, something that makes them feel like trash. This manga doesn’t offer a solution. There’s no character arc or anything, like where a character overcomes his shortcomings and learns from it. Their struggles may resonate with you — it’s simply a manga about a group of boys slowly working towards their goals, nothing more. A short story of some average boys in everyday life. You’ll notice this isn’t tagged “romance”. That’s because it isn’t. I did expect some, but came out disappointed. That’s because the “love interests” have mutual respect but not to the point of romantic love. I think their relationship could develop more with the help of more chapters, but this manga is a story that stands without romance. The art style with all the inky lines have an old 90’s anime style to them which was lovely. Character designs are also good! Overall it’s very clean and pretty. This manga is good, but I wasn’t fully satisfied. It’s like taking a walk through a charming little garden, or having the grandest dream but then waking up. It’s a little snapshot of daily life, and even though the details are hazy in my mind, it’s gives such a warm and comfy feeling. Read this, get up and stop feeling sorry for yourself. Let’s all work earnestly towards our goals like these boys. Just finished binging it and it's 3 am as of the time I'm writing this do I'll keep this concise. Slice of life so there's not much going but the events that are presented and occur throughout the manga are quite good in terms of quality. One thing that annoyed me the most was the way the romance was handled, it dragged out superbly long and the payoff was disappointing. The character design in this manga is something I love, it's simple yet detailed. The main cast somewhat memorable, I won't be forgetting the main characters soon and they're not copies of popular tropes. My only gripe is that Fujimoto's side of the story isn't as fleshed out as I'd like, we get nothing much outside basketball. Would be a 10/10 if the romance was handled better and Fujimoto was more fleshed out, it would certainly benefit from more chapters. Once in a while you stumble upon a story that hits home so hard on a certain period of your life, that you can't help but laugh and cry along. At the time of writing of this review Tetsugaku Letra has not been completed. And since no one else has done so yet I decided to write a review in order to urge others to read, what I consider to be, one of the greatest slice of life stories of all time. I'll start off by saying that Tetsugaku Letra is realistic. There are no fancy dreams to be achieved, no flashy goals and boisterous characters, and when there are they are realistically so. Problems encountered, such as bullying, are not exaggerated and I've found the author's approach to be rather tasteful. An exchange of shoes, and with them the discovery of a new hobby, is the premise of the story, and through it unfold the insecurities and troubles of its characters. The story is purely character driven, something I usually don't prefer, but Sahara Mizu does it masterfully so. Character interactions feel natural, if not slightly gloomy, and the humour is suiting of the general atmosphere of the story, which is a charming mix of both pessimism and optimism and a good dose of everyday life. I personally adore the art, it looks clean and simple and character expressions are rich. I can see why some people might dislike it though. Backgrounds are minimal and Sahara draws ears strangely, though I never had any issues with it. To compensate for the thin linework tones are used generously, which complement the story and art greatly. The characters are what make the story. None of them fall in any of the typical cliches and they're all flawed in one way or another, yet not in such a way that it becomes their main characteristic, instead only adding to the realism of the work. Tetsugaku Letra isn't the kind of work wherein you'll find your new favourite character, simply because the cast works dynamically together, instead of any individual standing out on their own too much. The protagonist, Ichinose Kimitaka, is slightly depressive, but that slowly changes as he decides to move on in his life. I greatly enjoyed his family's depiction, especially his interactions with his grandfather and sister. I found myself rooting for him on many occasions as his simple and naive approach to life was, if anything, heart warming. The cast is diverse and while not over the top, each character plays an important role in order to properly present the story. I've greatly enjoyed Tetsugaku Letra so far, and certainly hope there will be some kind of update to the manga soon. As of now there are 12 translated chapters, the last of them having been released last November. I do however urge you to read it despite the bleak prospects of getting an update any time soon, as it truly is worth it. Thank you for your time; feel free to contact me if you spot any errors or want to comment on anything mentioned above. Let me start by saying that I am head over heals in love with this manga. Even thought I know that rating 10 is pretty much as high as it gets, still I would rate it even higher if it was possible! 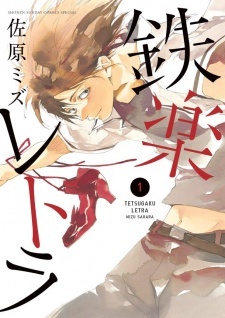 Tetsugaku letra is a “slice of life” story by Sahara Mizu, also known as Yumeka, Sumomo. To be honest , I didn't even know she existed until a few months ago. It was one of those days when you get tired of reading the same story over and over again, and finally decide to go look for something special. While I quickly went through many different mangas I discovered this heartwarming drawing on the front page of Tetsugaku letra. More than the actual description of the story I was attracted to the indescribably beautiful way of drawing by the author/artist. As I started reading Tetsugaku letra I soon realized that Sahara Mizu wasn't just good at drawing but simply a genius at everything she does. Story: The story is mainly about a boy in high school named Ichinose Kimitaka. After going though a hard period of his life, which had affected him so much that he confined himself in his room for almost two years, he finally decides to move on with his life. He then starts to realize how his lack of confidence to overcome difficult challenges in his life had affected his family, especially his little sister who always looked up to him. On his first day of high school he sees the girl he once had exchanged his basketball shoes with. Through these past two years she had managed to become a basketball player, he once had told her she would definitely be good at. When he realized how far ahead of him she was, he felt too ashamed to meet her. That’s when he decided that he would come to meet her once again, when he could look at her with head held high. Art: As you already might have guessed I am in love with the art. I can’t stop admiring Sahara Mizu enough for her capability to express every emotion through a simple drawing. This is something (for me) only one other author/artist is capable of, Tamura Yumi. Characters: Through out Tetsugaku letra you encounter many different characters, whom you cannot help but love. The main reason for that is because we are capable of seeing the good in every character. It shows you that people are not simply good or bad, they are the outcome of there own life experience. I find myself laughing, crying and then laughing once again, together with all the characters in this manga.